CGAL is a C++ library specialized on geometric computations. CGAL is a big project, therefore it is not included natively into SOFA extlibs’ directory. Here is the way to compile it for SOFA using CMake. Configure. Set GMP_DIR and MPFR_DIR to the location that you installed GMP and MPFR. Configure again and generate. You can now compile CGalPlugin. CGal: This tutorial will describe how to set up CGal using the installer provided by CGal, which is bundled with some additional required libraries. Boost: To use the version of Boost you downloaded, set the SOFA-EXTERNAL_BOOST_PATH cmake variable to its directory, for example: SOFA-EXTERNAL_BOOST_PATH = "C:Program Files (x86)boostboost_1_46_1"
CGAL: Run the installer that you downloaded above. At some point, there will be a dialog box asking about additional libraries that can be installed with your CGAL installation. Be sure that GMP/MPFR is selected. Press Configure. You shouldn’t have to make any changes to the configuration. Keep pressing Configure until none of the values show up red. If needed, set the Build Configuration to Release. Compile. Press Configure. Keep pressuring Configure until none of the values show up red. Note: If you have used the CGAL installer to install GMP and MPFR, it should find the directories for those libraries automatically. If for some reason GMP_DIR and MPFR_DIR are not set, you can direct set them to the appropriate directory. They are both located in your CGal directory under auxiliary/gmp. You can now open your Sofa solution and compile CGalPlugin. You can launch one of the example scenes available from the root (source directory): runSofa applications/plugins/CGALPlugin/scenes/MeshGenerationFromImage.scn This scene takes as input an Image representing a rectangular parallelepiped with 3 different label in the image. The CGAL library allows to mesh the image using different parameters (e.g. element size) depending on the label. 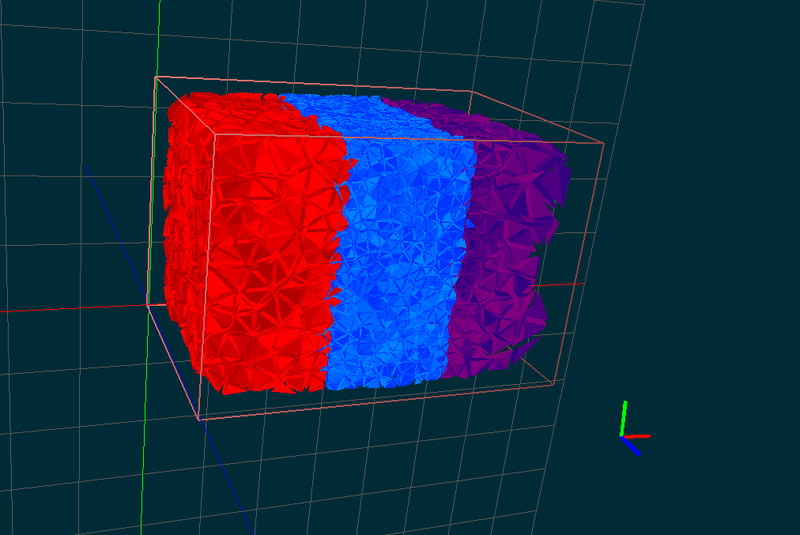 The middle zone (blue) has very fine elements, the purple area has medium-size elements and finally the red area includes coarse tetrahedra. The generated mesh can finally be exported.